These Now Leasing Flags are 14 Feet Tall! This Display is Sure to Set any Business Apart in a Competitive Marketplace. These Now Leasing Flags are Ready to Ship! 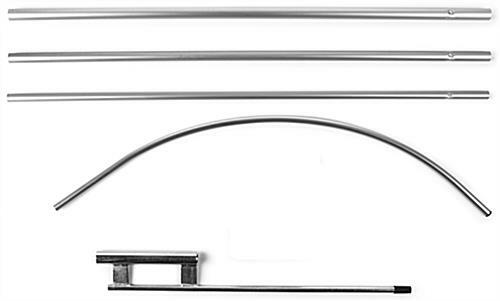 Aluminum pole has a 4 piece design that is portable and inexpensive. 14' Height and brightly colored red and yellow to create a presence. 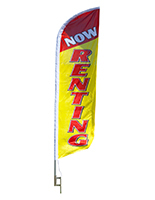 These now leasing flags that are portable come with a four piece aluminum pole that can be put together in minutes. This signage is perfect for real estate agents and apartment complexes who want more exposure. 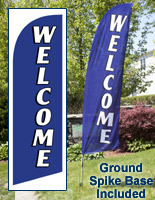 These colorful now leasing flags, also known as message banners, are 14 feet tall for an easy to read display. This bright outdoor display helps set businesses apart in a competitive market. 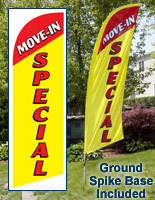 These now leasing flags that include a ground spike look great in front of any apartments or condominiums. This message banner is made of a poly knit material for long life and bright colors. 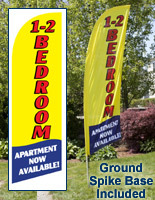 These now leasing flags have a stay open design so the banner is visible with or without wind! This low cost business marketing tool will save businesses money and draw in attention from potential customers! Users of these now leasing flags can strategically place them near the road to gain more exposure from potential buyers. This signage is the ideal outdoor advertising display. These swoopers, now leasing flags that are for outdoor use include a steel ground spike. This vibrant colored eye catcher sets up in minutes. These publicizing now leasing flags are likely to appeal the attention of possible lessees! This display is simple to use and carry. 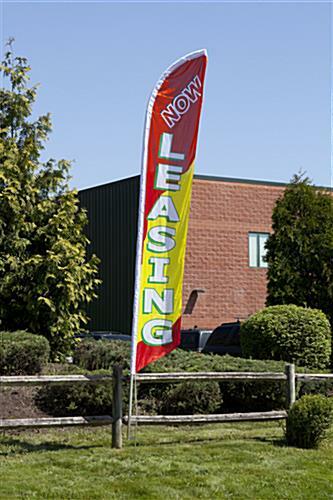 These now leasing flags include an aluminum pole, making this signage economical. Many corresponding displays use fiberglass poles, but aluminum poles are a fraction of the price and are still able to stand up to outdoor elements. These now leasing flags do not come with a nylon carrying case which makes this swooper more affordable than other models. This display is economical for small businesses and individual real estate agents seeking an affordable marketing tool.